On Saturday 29 July 2017 we had a great trip round Anglesey, Menai Bridge, Brynsiencyn, Malltraeth, Llangefni, Benllech, Pentraeth, Beaumaris and Penmon. 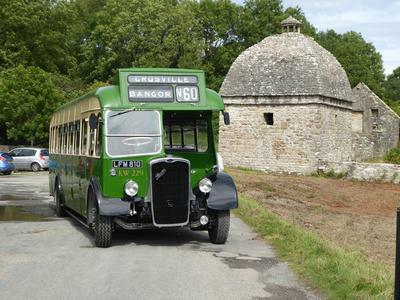 Amazingly we were charged £5 to turn the 1951 Crosville vehicle round at Penmon Priory by an "animated" individual who was discourteously referred to as the 'Toll Hagen' by a bystander. Ed note: Sorry to hear you had this experience; I am sure it was a random event. Hope you take future tours around the island. Also look out for the alternative via the MV Balmoral, which offers a view of Anglesey coast from the sea. can we go to other parts of Wales on this ol bus? Maybe all the way to Cardiff?